Not Your Mother’s Bobby Pins – Pretty Hair Accessories You’ll Want to Buy Now! So I use bobby pins almost every day, either to hold back little wisps of hair, or to help invisibly hold a style in place. But those kind of bobby pins, though really useful, are just practical. Not that there’s anything wrong with that, mind you. Let’s face it, we need practical sometimes. But wouldn’t you prefer a pretty hair accessory? One that doesn’t take a lot of fuss, can be slipped into literally any hairstyle, and can be as fancy or as funky as the spirit of the day guides you? We thought so. So take a peek at our picks for pretty hair accessories – decorative bobby pins every woman should want. (And buy!) I am starting a collection of these easy hair pins. They bring even an everyday hairstyle up a notch. And don’t we all deserve to be brought up a notch… in everything? Hair jewelry for your… well, hair! We love Anthropologie. Boho and fresh style, beautiful products. Try these Anthropologie bobby pin picks and treat yourself! This Gold Plated Bobby Pin is stunning. What a gorgeous piece to tuck back those pretty strands of hair. Again, you should be thinking of these pretty hair accessories like jewelry. Because they are! This hand crafted Oryan Bobby Pin is also gold plated, made with Swarovski crystals, and is gorgeous! Remember, just because it’s a bobby pin doesn’t mean you have to use it to hold your style. You can simply slip this in, pretty much anywhere, just to pretty it up! In fact, that’s the idea! Ok, these are definitely a splurge. But, oh, so worth it! This gorgeous embellished Juliette Bobby Pin Set is the creation of designer Jennifer Behr. She uses only top quality materials to hand craft these beautiful pieces of hair jewelry! This comes with a complete set, with 2 large and 3 smaller matching bobby pins. Swooning! 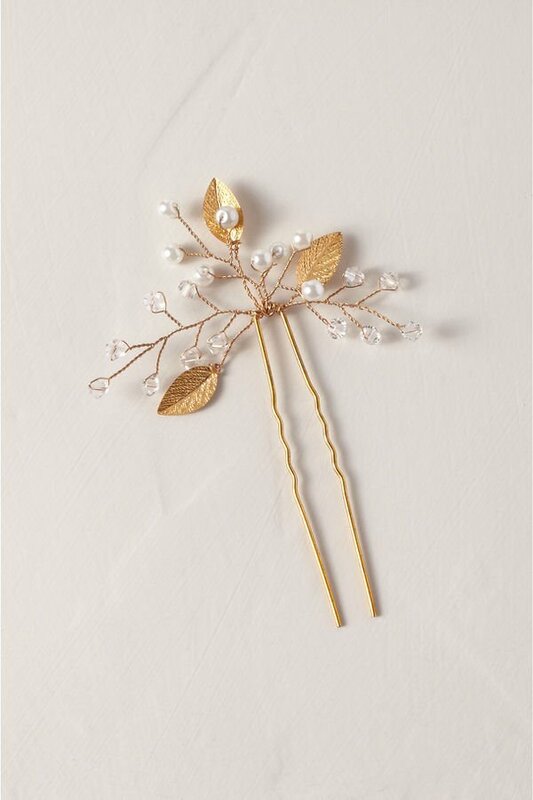 These pearl and crystal Mirabelle Hair Pins are perfect for a special occasion. Holiday parties, weddings, formal dinners… or just a fancy night out with the ones you love! Set of 2. These cute Little Gem Bobby Pins from ‘Saks’ come in gold, silver, black gem, crystal gem, even an orange gem! Less than $30, this black choice would be so cute in blond hair. If your hair is a cool tone, chose the silver, if it’s a warm tone, then try gold! Made in Germany with Swarovski crystals. Pair of 2. Another gold plated choice from ‘Lord & Taylor’. Also made with Swarovski crystals, this pretty “Nina” Orchid Flower Bobby Pin is perfect for a date night. Again, under $30! Comes in gold and silver. Oh, my goodness. The Iverness Hair Pin is the prettiest hair accessory! So delicate! Perfect for the bride, or for Mom! Did I mention, less than $30? The silver Vedette hair pin set is an art deco inspired design. We love that it’s different, but still has sparkle. Ok, last but definitely not least! These Valerie hair pins are so sweet and just a breath of fresh air! Which ones are you going to gift to yourself? I have two that are on my list! We think you will also love our posts on Best Cruelty Free Makeup Brands That Don’t Cost a Fortune, and Would a Short Hair Cut Look Good On You? Easy Trick to Know! Previous Post Palm Springs Tramway – Everything You Want To Know!